If you’re looking for a way to spruce up your yard, then you might need to consider adding a couple of lights to make it come alive. Apart from giving you effective solutions for night navigation, they also add style and ambience to your backyard. Unfortunately, installing a set of lights in your backyard can be both time-consuming and expensive, except you’re willing to go the solar way: install the best solar path lights instead of the traditional lights. Solar path lights are very simple, effective, and easy to install. In addition, they’re also easy to maintain since they utilize solar energy rather than electricity, which means each light is self-sufficient and will serve you without problems for many years. If you’re in the market for the best solar path lights for your backyard, then you’re in the right page. This article aims to give you all the required enlightenment in your bid to buy the best solar path lights. How to Select The Best Solar Path Lights? How to Clean and Maintain Solar Path light? Every solar path light features an inbuilt solar panel which is capable of converting sun power into electricity, which is then stored in the inbuilt rechargeable battery. Due to opulent sunshine, the charging process occurs in the day. Around evening time, a switch will turn the battery-powered LED bulbs on automatically, while the LED bulbs are automatically turned off during the day. LED bulbs have an incredible energy-economy, which means they can work for a very long time. In general, a single solar light provides uninterrupted lighting for around 6 to 10 hours. A solar light like that is a self-sustaining system which requires no exterior energy. You can, therefore, move and use them wherever you want as far as they are exposed to direct sunlight. The brightness is probably one of the most vital factors to consider when buying a solar path light. A lot of people always end up buying cheap lights with very low brightness. So ensure you purchase lights with a very high lumen rate. Keep in mind that lumens represent brightness in these lights and then more lumens a light has, the brighter it will be. You need to know that most cheap pathway solar lights emit only 1 to 9 lumens whilst other more powerful solar path lights emit about 10 to 30 lumens. Of course, solar path lights with 1 to 9 lumens will generate some brightness, but it won’t just be sufficient to illuminate your walkway appropriately. Another key criteria to consider when searching for the right pathway solar lights is the battery capacity. Purchasing a mode with a larger battery capacity is the best as this enables the light to work for a longer duration, which is great since you also want a light that is capable of working throughout the night. The battery capacity is when truer when buying brighter lights. These lights usually consume more energy to produce brighter lights, which means they can easily burn out if their battery capacity is small. Batteries with larger capacities can handle this energy requirement and enable the light to work all night long. The style is also a very important factor since you will be looking at these lights everyday. Of course, you don’t need being told how bad an idea it is to purchase a cosmetically poor-looking light that does not match the building’s décor. Besides, you don’t want to purchase a cheap light that appears like it will break as soon as it begins to rain. It is also important to consider the style of the light’s shadow and beam. These designs are usually determined by the light’s glass and enable you to light up wild fashions with traditional one. Also, keep in mind that some styles also affect the brightness of the solar light. The quality of the solar panel is also an important consideration. How quickly the light will convert sun energy into usable energy is determined by this factor. Therefore, this determines the light’s charging time. The conversion rates of solar panels with high-efficiency are usually up to 20 percent. Higher-efficiency solar panels are panels made with the latest technology. It’s a bad idea to buy a solar path light that uses old or dated technology. Also, the higher rate of conversion means you require less space for a specified wattage, which means you can have smaller panels that generate more energy. Since solar path lights are made for outdoors use, you must find ones made with durable and high-quality materials. High-quality solar path lights are typically engineered with a combination of metal and glass. These sorts of solar path lights have a tendency of being sturdier and being able to last longer. While most pathway solar lights are made with plastic cuts, buying ones that are made completely out of plastic is not a good idea. These plastic pathway lights usually struggle against extreme heat and rain, which means they are only perfect for average weathers with lots of sunshine. Read more: How to choose the Best Solar Post Light to Lighten Your Garden? If you’re in the market for the ideal solar path light for your yard, then you need to pay attention here. This section contains our reviews for our picks for the best solar path lights complete with their pros and cons. Most solar path lights are either very functional or very stylish. It’s only in rare cases you will find one that perfectly combines both functionality and stylishness such as the GardenBliss Garden Path Lights. The 10 lamps that come with this product are incredibly efficient due to the industrial design they have to them. These lamps, featuring 4 lumens each, are quite dim, and the smoky plastic lens generates more of a surrounding light than anything. In general, these path lights are best used as markers instead of lighting up a patio area or pathway. The product has an excellent height adjustment setting that allows you to choose between a shorter or taller height to match with your outdoor turf or you can utilize a mix. With a durable matte black construction, this light is capable of withstanding all sorts of conditions. The high-quality LED generates excellent Lumens and an optimum life of 20,000 hours. These lights are also easy and quick to install since they even come with durable stakes. Furthermore, this product also comes with 10 stakes and 10 ground spikes and rechargeable batteries. While it doesn’t come with a lifetime warranty, it comes with a 1-year money back guarantee, which while not extraordinary, is also decent. Two heights options offer convenience. A long 20,000 hours battery life. The plastics aren’t really durable. Taking the second spot on our list is the Moonrays 91754 Solar Path Light, which apart from being made out of high-quality materials, produces super bright lights. Judging from their reliability, it is no surprise that they are very popular on the market. producing a total lumens of 30 each, these lights are super bright. Their lumen rate is around 25 times higher than most other path lights out there, which is really impressive. Moreover, the light comes with a beamed glass lens that offers a 12-degree beam angle and 360-degree display of lighting. Also, the curved lens features broader ribbing which allows for a larger illumination area and higher light output. In addition, the lights are also very sturdy. They’re producing using premium-quality plastic and metal that has a bronze finish. Then Moonray 97154 comes with a large internal battery in which they store the sun power during the day. During the evening time, the solid 1,500 mAh batteries enable the lights to work for up to eight hours. While this is not the longest working time available, it is quite decent when you take the incredible power of this light into account. Coming up next on our list is the Cinoton Solar Light Path Torch, which combines both functionality and stylishness perfectly. They feature an innovative flame design to add some style to your space. Featuring 98 LED bulbs per light, these lights are very powerful and their frequencies are alternating to provide a flickering effect. Besides, the dancing flame design incorporated is extremely realistic, and a lot of customers find it really appealing. The lights also feature a daylight sensor which turns the lights on automatically at sunset and turns them off at dawn. Additionally, the lights are very easy to install – all you need is to affix the spike and put them into a light holder or into your lawn directly. When charged in average sun levels, the lights will spend about 8 hours and will last up to 10 hours when you charge them in the summer, and 5 hours when charged in the winter. If you’re buying them in the winter, we advise you to charge them for up to 2 days before utilizing them for the first time. Beyond that, the lights are also weatherproof and are capable of surviving any kind of weather. To guarantee high quality with consistent usage, the lights come with a 1-year warranty and a 2-month money back guarantee. Each pack contains 2 torches, so you might need to think about the total number of lights you might require before buying. Also, the lights are safe to use as every electric wiring is contained safely inside the lamp’s interior. The URPOWER Solar Path Lights have 2-in-1 functionality – they have both hooks and spikes so that they can either be hung on the wall or be used as in-the-ground lighting. They are also made with waterproof materials, which is very vital for outdoor lights in damp weathers. On a single charge, the solar-powered rechargeable battery will last for 6 to 9 hours. Also, each LED bulb offers 50 lumens, providing 200 lumens in total. The 2-in-1 waterproof solar lights have been improved recently to increase their durability. The spike has a cross style which means the wind won’t likely affect it. In addition, some rain-catching elements have been incorporated to stop water from entering the electrical components. Also, the material has been upgraded to a durable, anti-corrosion plastic, which is impressive. You can easily adjust the angle of the lights if you’re looking to control the direction its pointing at. The 2-in-1 lights take only between 6 to 8 hours to charge completely, which means they ought to be charged enough throughout the normal sunny day. Can be put in ground or hung. Hosus Tech is a fairly reputable company and the performance of this entry from them matches their huge reputation. The lights are very beautiful and they provide whit light with 6 lumens brightness. If you can afford the, these lights are perfect for any backyard. Apart from being weather resistant and incredibly sturdy, they also have a nice design and will last for many years. Furthermore, the Hosus Solar Pathway Lights come with a full 100 percent lifetime replacement guarantee, which tells how much confidence the manufacturer in the lights. No holders or wires are required, since the lights can be effortlessly put in the ground. Apparently, they automatically switch on and off. They are energy-efficient and already come with their batteries, which means you don’t need to make any separate purchases. Another lights with the unique 2-in-1 design is the InnoGear Upgraded Solar Lights. It can either be hung on the wall or be put in the ground for flawless lighting. These solar lights are perfect for lighting ever major sport on your deck, garden, driveway, or outdoor way. The light produces a brightness of 200 lumens to guarantee brightness around the installation area. They are also incredibly easy to use and install: just ensure they are exposed to full sunlight to enjoy the full benefits of the lights. It’s also totally weatherproof, which means it can hold up to water and heat. While you need to turn the switch on before use, they will do the remaining work independently. The lights are completely automatic as they shut on automatically at dusk and automatically shut off at dawn again. The brightness of this light falls somewhere in the middle, which means it is not excessively bright or excessively dim. This is a great option you might need to consider when looking for the perfect solar path lights for your backyard. Emits a very bright light. It works throughout the night when charged fully. Can bear any amount of cold, rain, or heat. The operating hours reduce to 4 to 6 hours in high brightness mode. The Voona Solar LED Path Lights are perfect for the outdoors. With its warm and soft glow, a pack of eight effortlessly light up a flower bed, walkway, or garden beautifully. There is no replacement or electricity costs, which means this is a one-time investment from which you can benefit for many hears. It also sports a beautiful design, which means it also adds style to the yard apart from illuminating it. Like we already mentioned, the lights have a stylish design with a stainless steel finish. It looks stunning when illuminated at night. And since it is waterproof, you can put it anywhere in the outdoors as they are capable of withstanding snow, heat, and heavy rains. The light charges in the sun during the day and lights up automatically at nights upon detecting darkness. They have an extremely easy, efficient, and problem-free operation. Automatically shuts on and off. Plastic hollow stake can be broken easily. The Enchanted Spaces Path Light Set is also another excellent option for lighting up your walkway at night. The pack contains six, which is ideal for small to medium-sized paths. There are spikes at the base of the lights which will fit into your lawn directly. The spikes are produced using reinforced metal with anti-rusting coating, which means they are sturdy and should last for many years. The light itself is produced using a reinforced glass cover, which guards the electrical components against wind, heat, and rain. Charging the light fully takes around 6 to 8 hours, which means they will be completely charged in the average sunlight. Also, the glass cover projects a beautiful star-shaped light pattern when the lights are illuminated fully at light. The manufacturers are very confident in this product that they back it up by a warranty. Comes with stakes for effortless installation. Batteries may suddenly stop working. The GIGALUMI Solar-Powered Pathway Light doesn’t only get rid of darkness, it does it beautifully. The sight provided by the light evokes a tremendous feeling of lameness and it can last for eight hours when charged fully. It recreates the look of outdoor spaces such as gardens, lawns, walkways, and balconies, from fine to sophisticated. Since it is solar-powered it comes with no saves you on energy cost and wiring stress. In addition, it is very easy to install. The manufacturer also offers a decent warranty which enables the consumer to get a replacement of a defective light. It packs a very power battery which enables the light to effectively light up the area throughout the night when charged fully. In general the GIGALUMI Pathway Light has successful won the hearts of several home users who all claim that they wouldn’t hesitate to choose the GIGALUMI light again if they ever need to purchase more solar lights. It is environmental-friendly, which makes it a perfect option for everyone. Installing this light on hard soil might take additional effort. Produced using die cast aluminum, the Plow & Hearth Solar Path Lights are probably the most durable solar lights on the market. They are also weather resistant, which means they can endure any sort of weather. A very detailed workmanship is obvious on these lights and they are perfect if you’re looking for stylish lights to decorate your pathway or yard. Each light head has 6 super bright LEDs. On a single charge, the 1 x 400 mAh lithium phosphate battery that comes with each light will last 10 hours, thereby offering you a lot of light throughout the night. Generally, these lights don’t come with many bad surprises. They are well made and beautiful, thereby making them a stylish addition to your yard. They also come with strong batteries that last a long time and they deliver super bright light. Even in rainy days, expect these lights to still be shining brightly. Each LED produced 50 lumens. May be excessively tall for some needs. Being an improved version on the SOLVAO Solar Spotlight, this model is one of the best options on offer. Despite being quite affordable, it packs a lot of power and features to make it an outstanding model with great value for money. It does not attach itself directly to the flagpole – you can effortlessly install it in your garden or lawn. Furthermore, it comes with an automatic light sensor which allows it to automatically turn on at dusk and turn off automatically at dawn, making it a very unique model. many products in the same price range and class are manually operated. Also, the SOLVAO Solar Spotlight offers a lot of power. It contains a total brightness of 200 lumens, which is sufficient to light up your yard and patio. Besides, the light’s angle can be customized to fit your arrangement. This unit also has a very durable construction and is weatherproof. Regardless of the weather condition, you can be sure that this spotlight will continue working. The light can also be used to illuminate other outdoor subjects like signs or trees. The possibilities are just limitless with this incredible product. Automatic shut on and off. Easily fits in any garden or yard. The two primary things you must consider when buying a lighting device for your yard are its light production capacity and its ability to hold up to different weather conditions. Certainly, the TomCare Flickering Solar Lights ticks both boxes perfectly, making it an ideal solution to several outdoor lighting. The lights have a dancing flame design which is fairly stylish and captivating. Also, they have a sturdy weatherproof design which helps make them very reliable. Furthermore, the lamps come with an automatic shut off and on function, which helps minimize human operation. The lamps are also very easy to set up and use – there are no needs for wires, just put them in the ground. Also, there is no need for extra electrical tools since the lights are solar powered – simply put it under direct sun to harness energy which will then be converted into electricity. Outfitted with a high-capacity lithium rechargeable battery, this product has a long working time. When charged fully, it is capable of lasting up to 10 hours during the summer and up to 5 hours during the winter. And charging it fully takes around 8 hours, which is fairly decent considering some other models take up to a day. Charging takes just 8 hours. The HGTV Solar LED Path Lights come with 4000mAh rechargeable batteries and are capable of running continuously for about 8 hours on a single full charge. Just like several other solar path lights, this eight-pack light from HGTV is also easy to set up – just push them into the ground and that’s it. The easy installation is a great bonus for versatility, as it allows you to change and twist the décor as you like. In addition, the light has a durable casing that is made of solid stainless steel. It’s powder-coated in a warm black color, which complements the light perfectly. Every light measures about 18.4” in height and besides the actual light, the package includes a battery, a solar panel, and a stylish glass lens. You will find that the tubes are quite hollow, which allows people looking to install them at a higher height to drill them. However, this is not what they were made for. If you’re in the search of something elegant and stylish, but sufficiently versatile to match any kind of landscape, then look no further. The Oak Leaf Solar Pathway Lights were designed with all these in mind. They have a bollard shape which adds a bit of style and elegance to your doorway. Whether you have wood planks, stones, or just a simple pathway, the lights will match the décor effortlessly. They are made using rustproof stainless steel and have crystal plastic lenses. To put it simply, they are capable of standing up to any sort of weather. The lights produce a brightness of 6 lumens per light and they have a color temperature ranging between 3000K and 3500K. The lights have dimpled lenses, which allow the warm light to scatter around the stick. Moreover, the lights are capable of running continuously for 8 hours on a full charge. Besides, they have an automatic sensor which switches the lights on and off automatically according to the time of the day. As regards the installation, you’ll need to put a couple of components together before the spikes can be pushed into the ground. They run for long hours. Several users complained of them being fragile. Featuring for the second time on this article, you don’t need a soothsayer to tell how a great a company GIGALUMI is. This model is also nothing but another high-quality product from the famed company. These lights feature some pineapple-shaped lenses, which manufacture a unique pattern. There is a skirt part beneath the lens that increases the quite dramatic effect. The set comes with 6 different lights, which you can use to attention to your pathway or maybe a point of focus in your yard. The lights are fairly easy to install – no need for wires or electricity. There is also a sensor which automatically detects when its dusk and dawn and switch on and off the lights accordingly. The casing of the light is producing using a durable stainless steel. It’s not powder-coated in anyway, so it’s likely to keep up its sparkly look for a long time. These lights also come with a strong battery which allow them to run continuously for around 8 hours when charged fully. Can run for 8 hours. They just snap off after some time. Any shrub, tree or plant that may be blocking the ray of the sun has to be pruned regularly to ensure your panels enjoy direct exposure to sunlight. Since your solar lights rely totally on sunlight, you need to carry out this task on a regular basis. Depending on how quick the surrounding bushes and trees grow, they may have to be pruned as frequently as once per month. This step is essential to the maintenance of solar lights and will have a direct influence on how well your lights work. Solar panels covered with dust can’t charge the battery fully during sun hours. For two reasons, you need to consider this a big issue. The first problem is that your lights won’t likely function for long at nighttime since the battery won’t have sufficient stored energy. besides, this issue may shorten your battery’s life. Cleaning your solar lights with a soft cloth and soapy water is the best. You may require a soft brush to eliminate stubborn debris and mud. We advise you to clean your solar lights early in the day or late in the evening to avoid doing the cleaning when the fittings are hot. For optimum operation, homeowners are advised to clean their panels once per month. You may need to increase this frequency if you live in a very dusty area. Whilst you have a soft cloth, scrub brush out, and soapy water, you can clean any debris, dust, or debris from the bulbs and fixtures. Keep in mind that cleaning the plastic or metal parts of your solar path lights can prolong their life and make them to keep being visually appealing. Cleaning the plastic or glass gloms makes sure that dust and dirt aren’t hindering illumination. While you’re cleaning your bulbs and fixtures, check them for likely damages, like dented metal parts, cracked plastic or cracked globes. If you discover any damage, you may have to replace only the damaged components or completely change the fixture. If your solar lights aren’t functioning properly or your batteries seem not to be charging fully, it may be because your batteries have corroded. You may require tools to disassemble the fixtures and properly access the housing of the battery. As soon as the batteries have been exposed, look if you would see any white dust. While you can always use a soft brush to remove light corrosion, more dogged corrosion may only be removed with fine-grit sandpaper. While one advantage of opting for a solar pathway light is that you don’t need to worry about purchasing electrical wires, there are still some wires that may require your attention from time to time. On the chance that the fixtures are independent from the panels, there will be a wire linking the two, which can be bitten by pets or wildlife. The more typical case is basically having internal wires linking your solar panel to the battery. While this wire is fairly protected, wildlife can still find a way to access and chew it. There aren’t many individuals that know that solar lights can be charged by the incandescent lights. To put it simply, an incandescent globule would generate all the wavelengths produced by the sun, only in varying amounts. As you expected, it is sufficiently bright. The receptors are responsible for transforming the light into usable current that is storable for later use. Therefore, this will manufacture the proper light for charging your solar-powered lights. Working on a similar theory to the incandescent light we just explained, you can utilize a LED light to charge your solar lights. LED is engineered to manufacture a range of light wavelengths, consisting of long infrared waves, ultraviolet waves, and visible light, just like the Sun. You can still charge your solar-powered lights on cloudy days since they have light receptors. The light receptors are usually sufficiently sensitive to transform the least amount of light into electric energy. However, while we can still charge our solar lights on cloudy days, it’s not always as effective as when there is full sunlight. Due to the incredible quality and performance offered by each product on this list, it wasn’t easy choosing a favorite. In the end, our choice boiled down to performance and value for money, and no other option ticks these boxes better than the GardenBliss 10 Pack of Outdoor Solar Garden Path Lights. It sports a unique design which offers security and stability, whilst its bright LED bulbs and modest style offer both great illumination and appealing aesthetic quality. 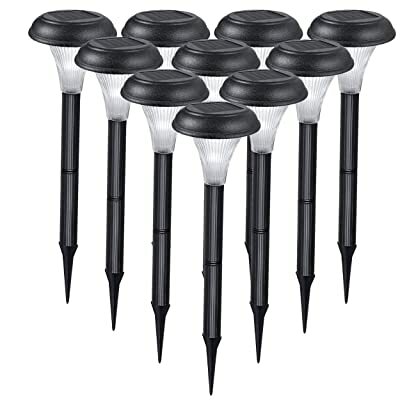 While the Enchanted Spaces was close in the running primarily due to its better performance in some categories, we don’t think any other path light can top these elegant, stable, and effective GardenBliss 10 Pack of Outdoor Solar Garden Path Lights in terms of quality and value. In general, our all picks for the best solar path lights are excellent options and you won’t likely regret going for any of them. Just make sure you keep all our tips and recommendations in mind as you shop for the ideal option for your needs.